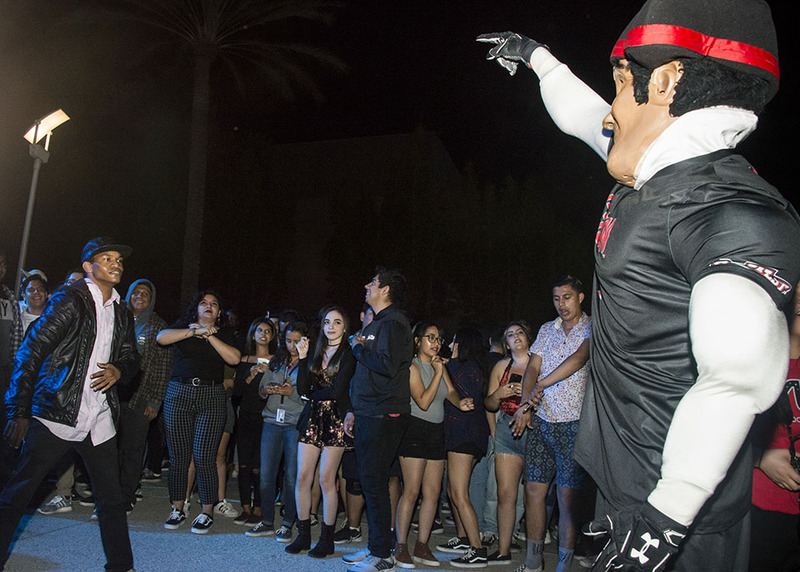 Matty the Matador dances with CSUN students, Sept. 15, 2017. Photo by David J. Hawkins. 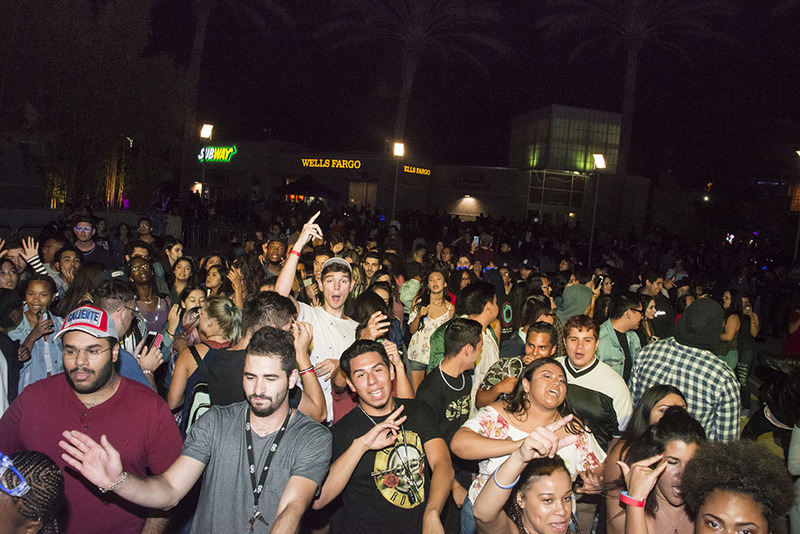 About 3,600 students party together at Matador Nights on Sept. 15, 2017. Photo by David J. Hawkins. 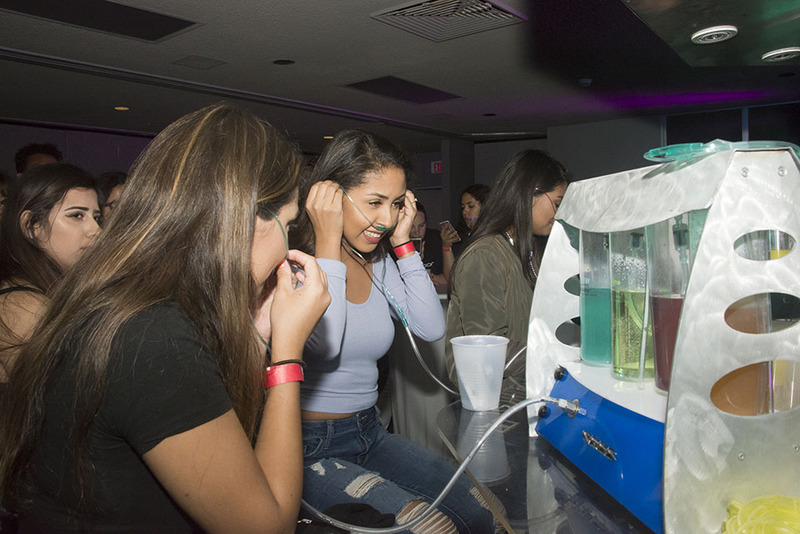 Students sample scents such as spearmint at the Matador Nights oxygen bar. Photo by David J. Hawkins. 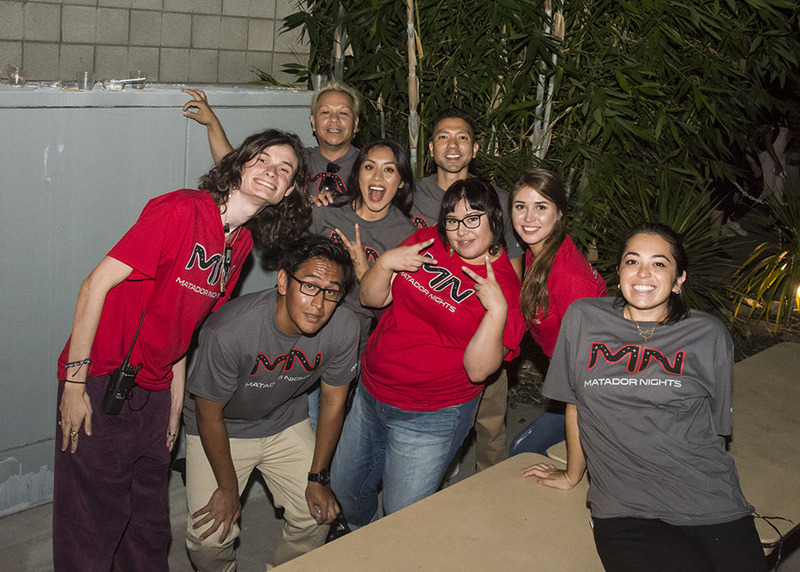 ​Student volunteers work at Matador Nights on Sept. 15, 2017. Photo by David J. Hawkins. The crowd jumps to the music in front of the DJ. Photo by David J. Hawkins. Students at Matador Nights 2017. Photo by David J. Hawkins. 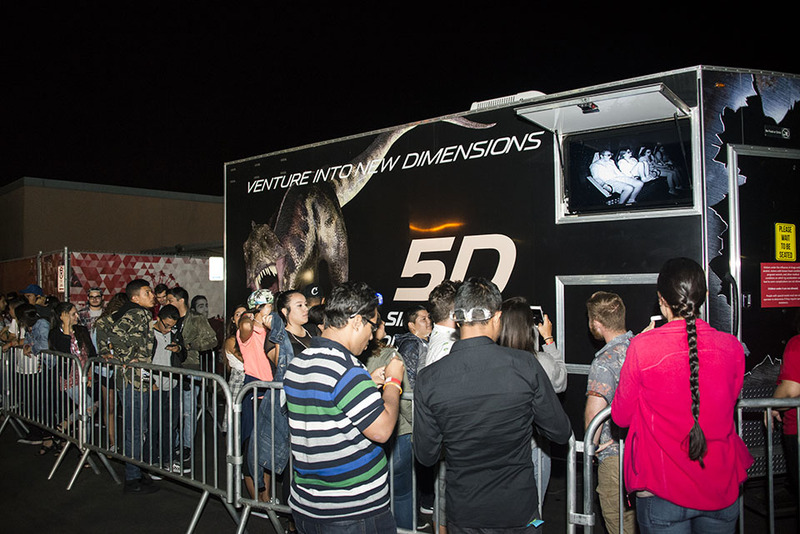 Riders wait in line for the 5-D simulator, an enhanced 3-D ride. Photo by David J. Hawkins. 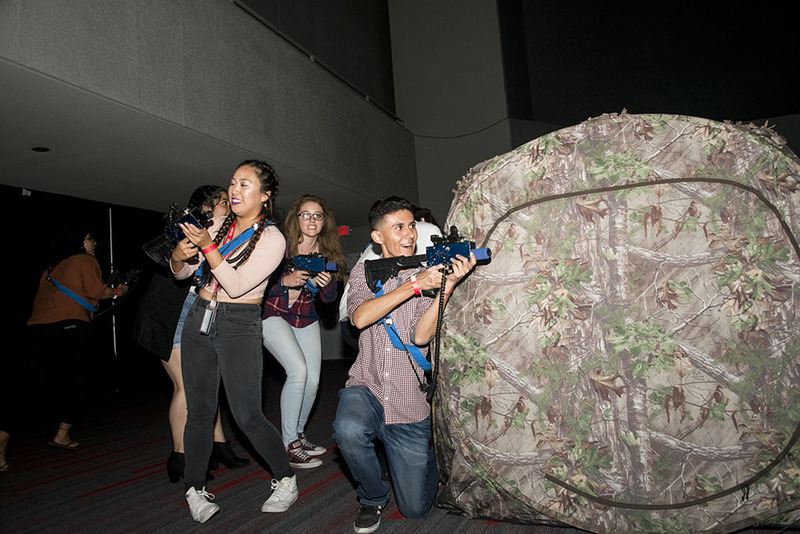 Students play laser tag and hide behind fake rocks. Photo by David J. Hawkins. 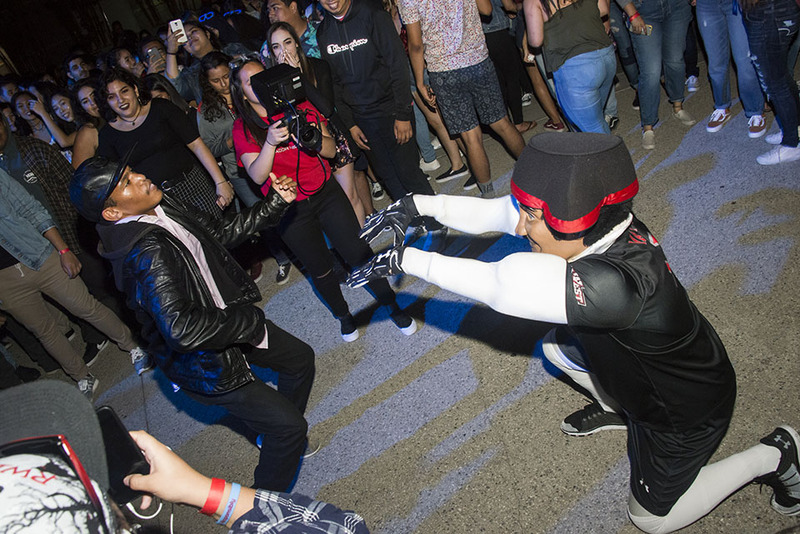 Futuristic-looking dancers match the theme “The Future Starts Now” at Matador Nights. Photo by David J. Hawkins. The crowd dances to the sounds of DJ Mal-Ski and DJ Baby Yu. Photo by David J. Hawkins. 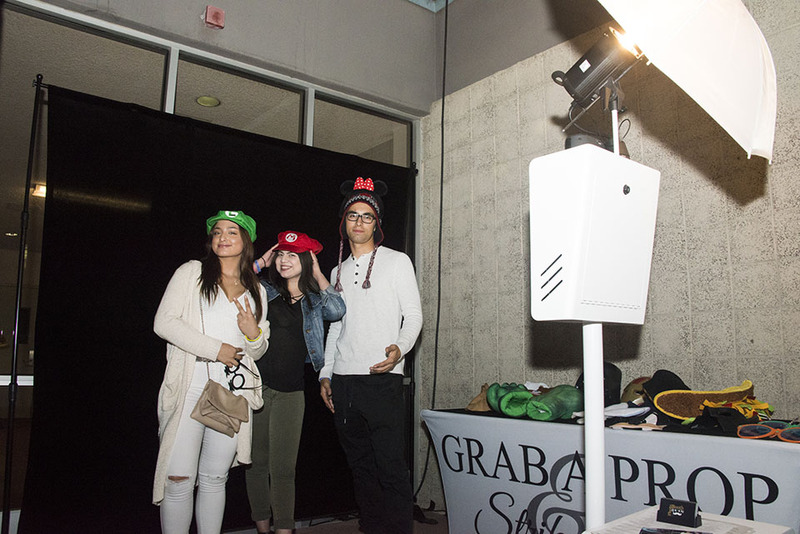 Students dress up to take a picture at the Matador Nights photo booth, Sept. 15, 2017. Photo by David J. Hawkins. Matty the Matador challenges students to a dance battle. Photo by David J. Hawkins. 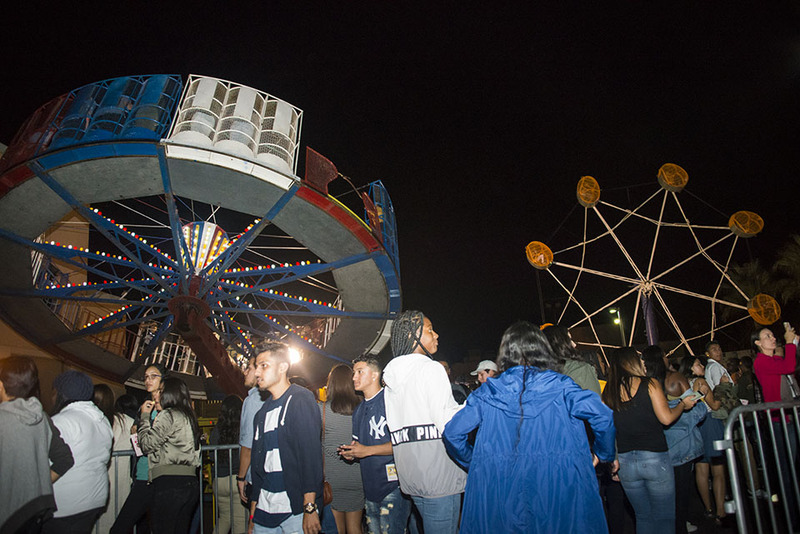 Carnival rides transformed the area behind CSUN's University Student Union. Photo by David J. Hawkins. 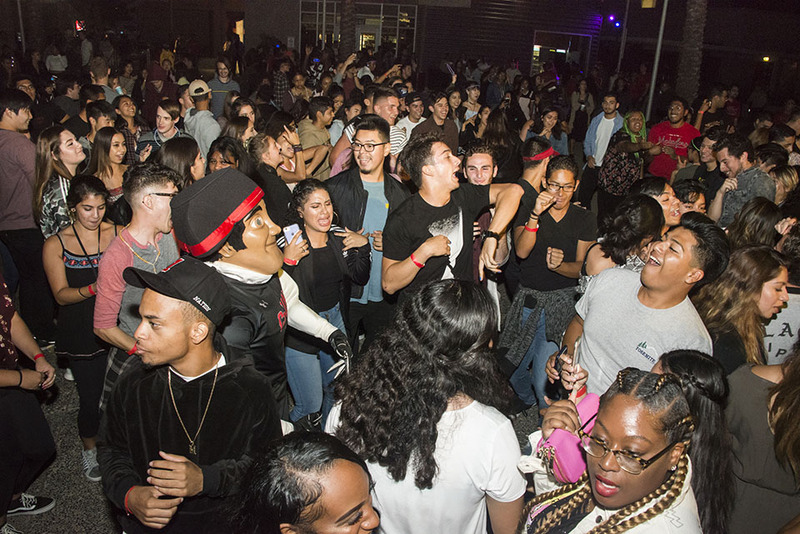 People dance through the night at Matador Nights on Sept. 15, 2017. Photo by David J. Hawkins. 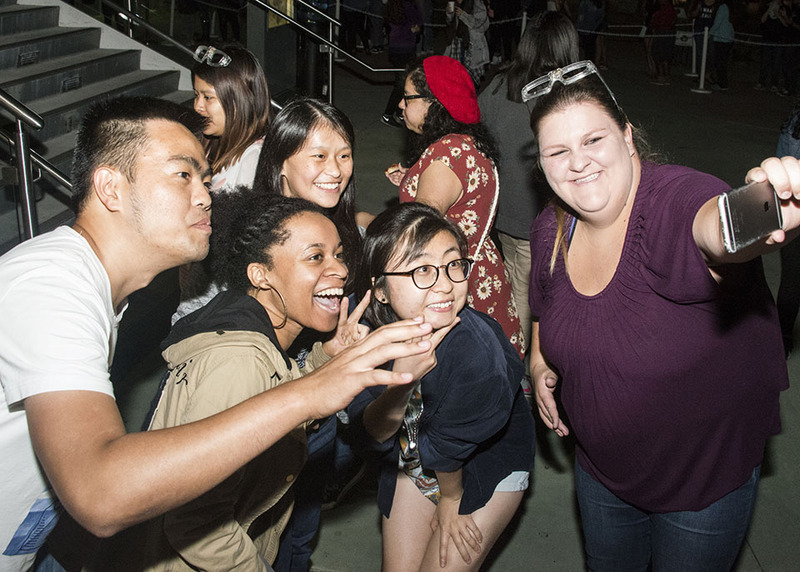 CSUN students snap a selfie at Matador Nights on Sept. 15, 2017. Photo by David J. Hawkins. It was a night of laughter, screams of delight and good music. 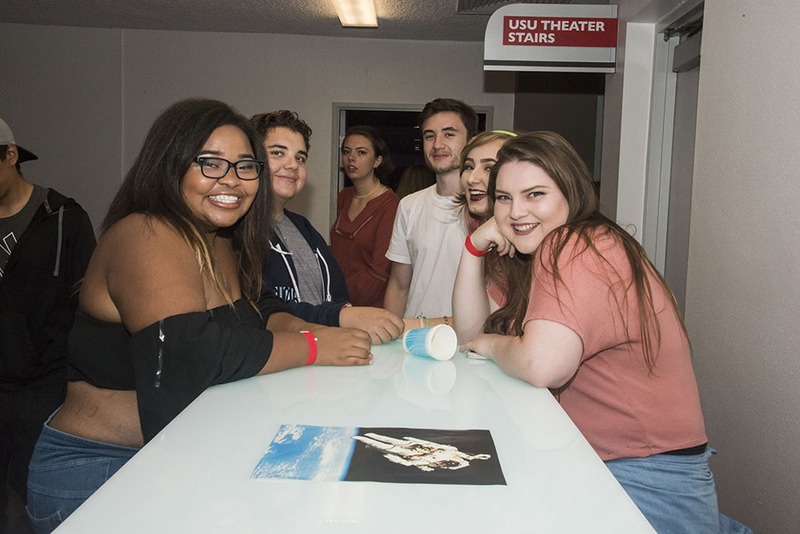 At this year’s Matador Nights, sponsored by the University Student Union (USU), students at California State University, Northridge time traveled to the year 3017. This year’s theme was The Future Starts Now. 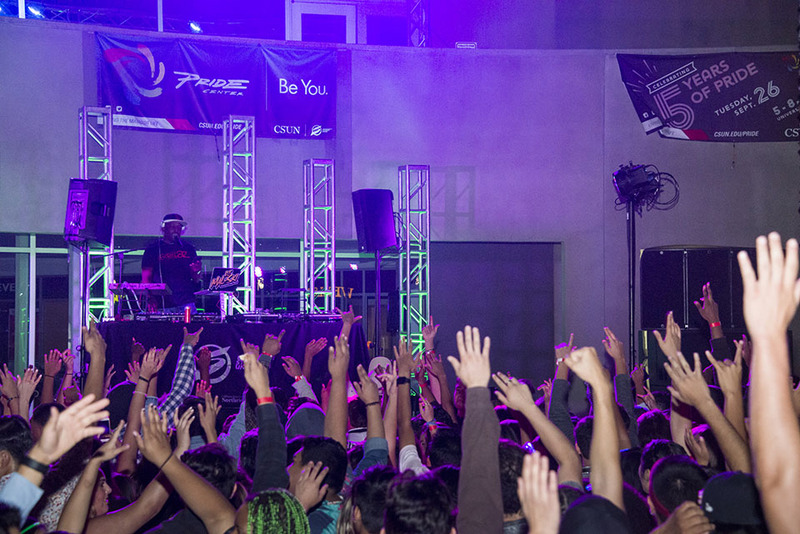 For one night, the USU’s Plaza del Sol was transformed into a futuristic soirée. 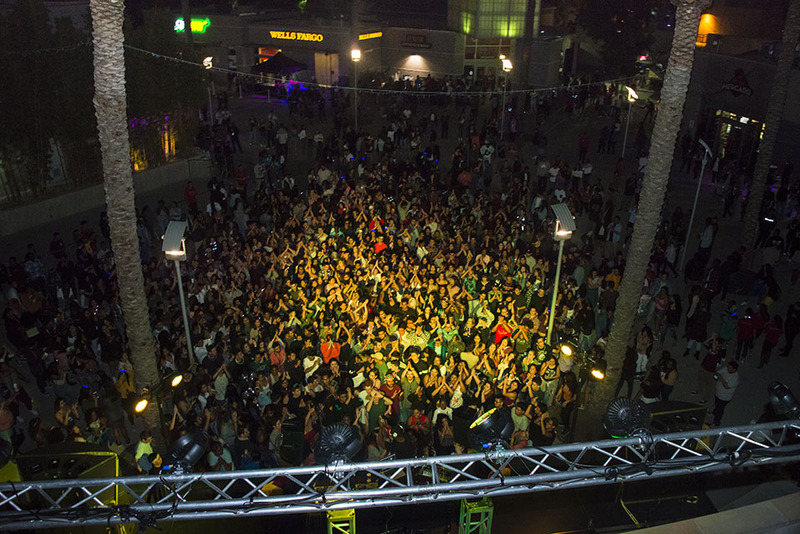 Approximately 3,600 students attended Matador Nights, and many stayed until 1 a.m.
On stage, DJ Mal-Ski and DJ Baby Yu kept the crowd dancing. Matty the Matador interacted with students the whole night and challenged them to dance battles. A ferris wheel and a spinning roller coaster were some of the many attractions. Business management freshman Kayla Bolton expressed her excitement after both rides. “They were so much fun,” she said. What would Matador Nights be without a laser game? The lines were long, but the wait was well worth it, students said. Once participants made it into the playing arena, they ran and hid behind fake rocks, trying not to get tagged by competitors. Another futuristic experience offered by the USU was a 5-D simulator — an enhanced 3-D experience. A movie was synced with the riders’ moveable seats, and at some scenes, they had water and air coming at them. Those who preferred a more relaxing night unwound at an oxygen bar or ate at the food stands that served popcorn, ice cream and hot dogs. More than 100 students, staff and volunteers chaperoned the night to create a safe and fun evening. Jesus Perez, a USU student assistant employee and English creative writing junior, said he was happy to help anyone who needed assistance. “I like to be a part of the community by being involved,” he said.